This is the third Sunken City adventure written by Jon Marr for Purple Sorcerer Games. This is a 0-level funnel, which means it has to answer the most important question of all: Why are your characters adventurers? Think about it. The game world is filled with parsnip farmers and merchants, but something sets your PCs apart from the run-of-the-mill herdsmen and ditch diggers. What is it? 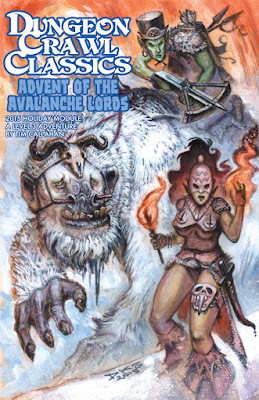 Another thing that comes up often in discussions of the Dungeon Crawl Classics game is working the machinations of various patrons and/or gods into actual game play. Doing so, and doing so well, is a hallmark of Jon Marr’s work. 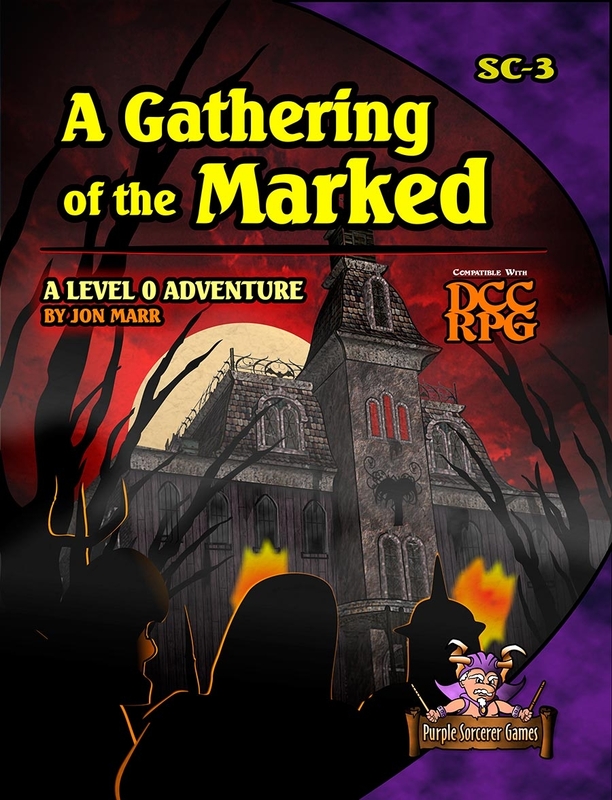 This is certainly the case in A Gathering of the Marked, where both a demon and a patron vie, using the PCs as their pawns to meet differing goals. This adventure is filled with fun and creepy material. It contains two of the best magic items to appear in a Dungeon Crawl Classics adventure: Master Shock and The Manual of the Swordsman. Both items offer real benefits, but neither is a cure-all, and there may be consequences for the benefits received! 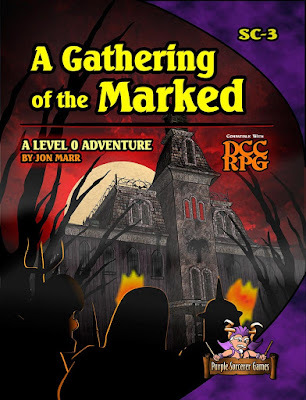 As is normal for Purple Sorcerer, the company web site contains many printable extras – including maps and paper minis – to help you present the adventure to your players. All in all, it is excellent value for the money…but unless you are a completest you should consider investing in The Sunken City Adventure Omnibus & Guide, which I will eventually get to in this blog. It should be noted that all Sunken City adventures have a distinctive artistic style. I have described it as “South Park meets H.P. Lovecraft” – images that are often both funny and disturbing. The illustrations are very different from those you would find in a Goodman Games product, for example. Purple Sorcerer is good enough to make them printable on their website, allowing the prospective judge to use them as player handouts. I ran this adventure for a group which had tackled several Dungeon Crawl Classics funnels before, and they did very well in it. They were able to maximize their chances by using their brains to reduce how often they had to use their dice. They still experienced the usual attrition…but not necessarily where I had thought it most likely. They were engaged and had fun, which is always the best metric for any adventure.